The basic structural element of NeuroMatic is an Igor data folder, which resides inside Igor’s local memory known as the “root” directory. NeuroMatic Data Folders contain your acquired/imported/simulated data and all variables and subfolders necessary to interact with NeuroMatic. Within each NeuroMatic Data Folder are arrays of data, referred to as “waves” which is short for “waveforms”. Waves might consist of a series of membrane voltage recordings acquired from a neuron via a patch-clamp amplifier. To allow analysis of a series of multi-channel waves, e.g. data simultaneously acquired from multiple analog channels of a data acquisition (DAQ) device, NeuroMatic assigns a series of waves to one or more “channels” denoted with consecutive letters A, B, C, etc. Use the Folder drop-down menu (1) to select the NeuroMatic Data Folder to analyze, or to execute a folder function such as “New”, “Save”, “Duplicate” or “Close”. 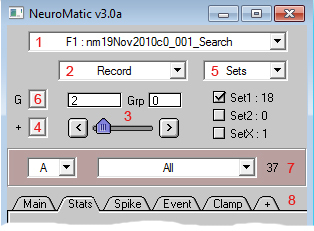 The default NeuroMatic Data Folder is “nmFolder0” which is automatically created once NeuroMatic starts. Select the Folder function “Open Data File(s)” to open one or more data files saved on a disk. Data files can be those created by NeuroMatic (pxp extension) or Pclamp Axon Binary Files (abf extension) or Axograph binary files or HDF5 files (requires activation of the HDF5 XOP provided by WaveMetrics). In the above figure, the currently selected NeuroMatic data folder is “nm19Nov2010c2_001_Search”. This folder was created by NeuroMatic’s Clamp Tab using the stimulus protocol “Search”, and contains 38 acquired waves named RecordA0, RecordA1, RecordA2 ... RecordA37. Note, Igor and NeuroMatic count from 0. NeuroMatic Data Folders contain a string variable called CurrentPrefix that determines which data waves NeuroMatic displays and analyzes. The value of CurrentPrefix is displayed at the top of NeuroMatic’s control panel in a drop-down menu (2). Use this menu to add or change the value of CurrentPrefix. NeuroMatic will search for any data waves in the current NeuroMatic data folder whose name begins with the selected prefix, after which you can use the wave increment controls (3) to step through your data waves. In the above figure, CurrentPrefix = “Record”. NeuroMatic recognizes 38 waves in the current data folder named RecordA0, RecordA1, RecordA2 ... RecordA37, where “A” stands for the first recorded data channel. Note, one wave has been excluded in the count since it resides in SetX (5). Use the < > buttons or slider control (3) to step through your data waves that begin with CurrentPrefix. The number displayed is the global variable CurrentWave, which resides in the current wave-prefix subfolder. In the above figure, CurrentWave = 2, which corresponds to RecordA2, which happens to be included in Set1 and Group0. As you step through your data, the current active wave(s) will be displayed in one or more NeuroMatic Channel Graphs. Use the (+) drop-down menu (4) to change the behavior of the wave-number increment controls (3). For example, if you want to step through every other wave, select “Wave Increment > 1” and enter 2, or if you want to step through only those waves selected via the Channel & Wave Select Controls (7), select “As Wave Select”. Data waves can be categorized into various Sets (5), such as Set1, Set2 and SetX. To categorize the current wave RecordA2 as Set1, for example, check the Set1 checkbox. If you have a lot of data waves to categorize as Set1, use the “Define” function, or the Sets Edit Panel. To execute a NeuroMatic analysis function on a particular Set, such as “Baseline” or “Average” or Stats “All Waves”, use the Channel & Wave Select Controls (7) to select the Set or combination of Sets you wish to analyze before executing the analysis function. Note, SetX is a special Set used to exclude data from all analyses. SetX is useful if you have bad traces that need to be discarded. In the above figure, 18 waves have been placed in Set1, no waves in Set2, and 1 wave in SetX. The current wave RecordA2 resides in Set1, but not Set2 or SetX, as denoted by the checkboxes. If your data consists of several repetitions of a stimulus protocol, use Groups (6) to categorize your data waves. Consider for example a voltage stimulus protocol with 10 different voltage steps repeated 15 times resulting in 150 waves. Setting the number of groups to 10 via the “Define” function, or the Groups Edit Panel, will now allow you to analyze each voltage step independently using the Channel & Wave Select Controls (7). If Groups is on, the group number pertaining to each wave appears to the right of the current wave number (e.g. Grp 0). Select the data channel to analyze with the channel drop-down menu (for example, “A” for channel 0) and the data Sets to analyze with the wave drop-down menu (for example, “All” or “Set1” or “Group0”). The number of waves selected appears to the right (in the above figure there are 37 active waves). The channel and wave select controls (7) are global in that they determine the waves to be analyzed within the various analysis tabs such as Main, Stats, Spike, Event, etc. Select the NeuroMatic tab you wish to use ... Main, Stats, Spike, Event, Clamp, Fit, Pulse, Model, Demo. Select the “+” tab to add or remove a tab. Create your own tab using the Demo Tab as a foundation. To edit NeuroMatic Configurations, Click on the “Configs” checkbox on the bottom of the panel. Click on a tab to edit its configurations.